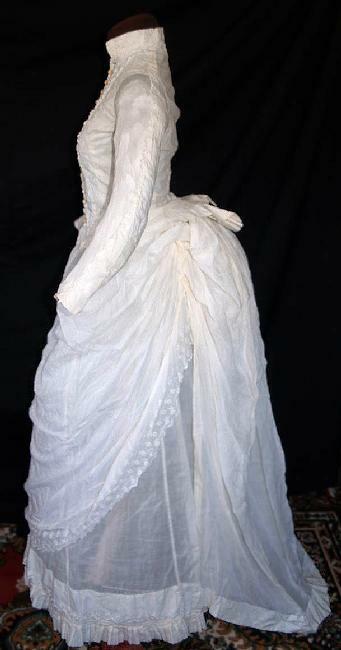 This charming 1880's bustle strolling dress is made of fine Snowwhite muslin with beautiful hand embroidery throughout. The embroidery work is done in elegant floral and leaves motif (see pic). The bodice has a small stand-up collar with beautiful White embroidery work. The bodice has a "V" shape beautiful center front, decorated with Scallop edging embroidery work. It has long tightly fitted sleeves which have matching embroidery flowers & leaves. 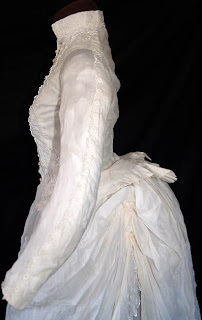 The bodice has a short waistline at the front with elegant pleated tail in the back to goes over a large bustle. The bodice closes with a series of wonderful rounded shell buttons(see pic). 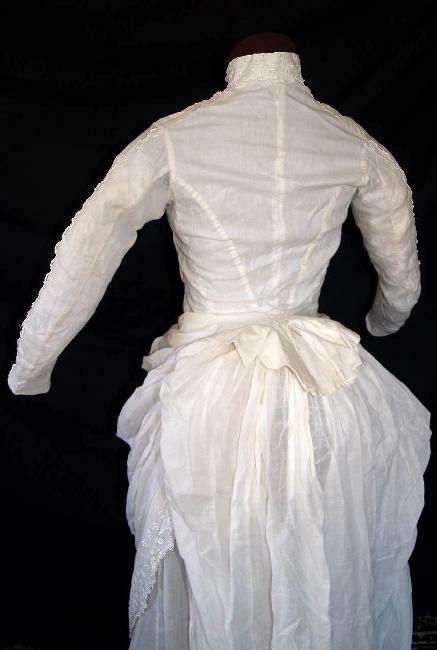 The inside of the bodice is lined with fine white cotton. The magnificant skirt has a large graceful Butterfly bustle in the back with a train. The skirt has an apron front with matching embroidery floralas well(see pic). Underskirt is pleated around the hem & also has matching floral work above. The back waist of the skirt is tightly Cartridge pleated to accomodate a large bustle cage. 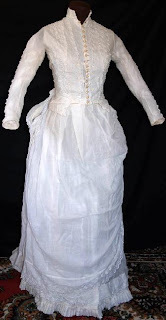 The bodice measures 13" across the shoulders, 32" bust, 26" waist & 21" long sleeves. The skirt measures 27" waist, 39" front & 46" in back length. The gown is in most pristine condition with very few light age spots. There are NO splits, stains or holes. 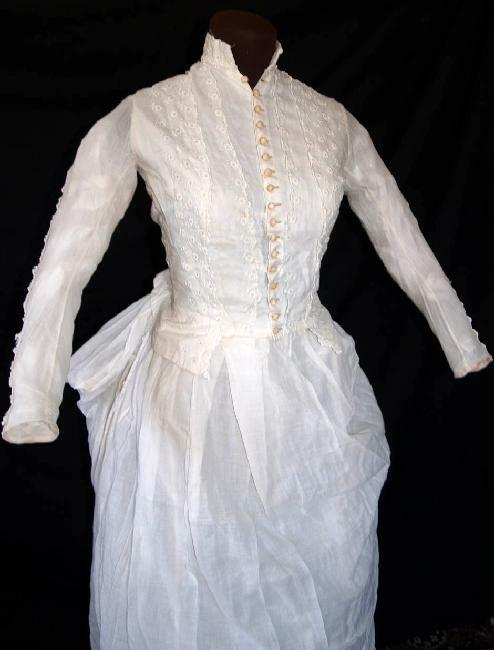 Otherwise this is a Unique hard to find summer bustle strolling dress from 1880's! A beautiful Example! This is an awesome find! It does seem the summer bustle dresses are harder to come by, but I've seen and saved a few to this blog.